Somehow a set of deeply conservative assumptions about children—what they’re like and how they should be raised—has congealed into the conventional wisdom in our society. Parents are accused of being both permissive and overprotective, unwilling to set limits and afraid to let their kids fail. Alfie Kohn systematically debunks these beliefs, not only challenging erroneous factual claims but also exposing the troubling ideology that underlies them. 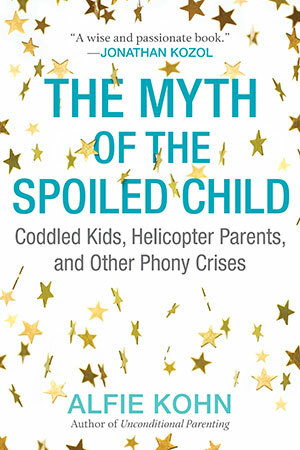 Complaints about pushover parents and coddled kids are hardly new, he shows, and there is no evidence that either phenomenon is especially widespread today—let alone more common than in previous generations. Moreover, new research reveals that helicopter parenting is quite rare and, surprisingly, may do more good than harm when it does occur. The major threat to healthy child development, Kohn argues, is parenting that is too controlling rather than too indulgent. Kohn’s invitation to reexamine these and other assumptions is particularly timely; his book has the potential to change our culture’s conversation about kids and the people who raise them. —Jeffrey Jensen Arnett, coauthor of When Will My Grown-Up Kid Grow Up?